Learn ski touring basics and practice this fantastic activity around El Peretol and Ransol, in Andorra, on this 2-day introductory course led by alpine guide Patrick. Get started with ski touring and learn the activity's basics. Discover a beautiful natural area in Andorra, in the middle of the Pyrenees. Practice and improve your skills in the company of an experienced guide. Follow me on this 2-day introductory ski touring course in Andorra and explore wild slopes and fun descents! Located in the middle of the Pyrenees, the principality of Andorra offers amazing skiing terrain and breathtaking alpine views. Both aspects make it an ideal area to explore the backcountry terrain with your skis on. If you come with me on this course, we’ll discover the snow and landscapes of this beautiful area between Spain and France. The purpose of this program is to provide you with all the necessary tools for you to begin ski touring and enjoy it safely. Some areas where we’ll enjoy skiing will be El Peretol and Ransol, both in Canillo. On day 1, I’ll teach you about equipment, coordination, routes modifications as well as ascent and descent skills. We’ll spend part of this day indoors, and then we’ll practice outside on friendly terrain. Then, on day 2, we’ll go directly to the mountains and put into practice everything that we’ve learned the day before. We’ll go to an easy summit and you’ll learn about ski crampons and descent techniques, among other useful skills. As for the requirements, don’t forget it’s necessary to have a good level of fitness and some prior on-piste skiing experience. So, would you like to take part of this ski touring course in Andorra? If that’s so, then all you need to do is send the request to make your reservation! In addition, I also lead a ski touring workshop to improve your abilities in the Pyrenees. Check it out! Not included: personal insurance and equipment. However, there will be the chance to rent the equipment. Equipment list: DVA, shovel, probe, skis, skins, boots, sticks, helmet, crampons, backpack, warming clothes, hat, gloves, sunglasses, ski mask, sunscreen, snacks and water. 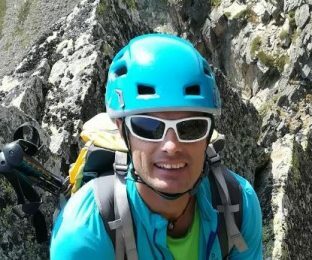 High Mountain Sports technician (certification from La Pobla de Segur IES) and member of AGAMA (Andorra Mountain Guides Association). I have been a mountain guide since 2004. I started out as a mountain leader and now I am a mountain guide. I love the mountain in general, but what I prefer is climbing. I have traveled to many countries around the world to climb: Morocco, Jordan, United States and Greece. With customers, I really like mountain skiing, climbing peaks and skiing in good snow! I hope to share the mountain with you, convey my passion and have fun with your company!